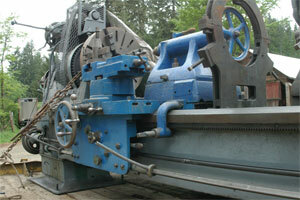 This American Tool Works (ATW) lathe was acquired in Port Townsend, WA 175 miles to the north of here. Reportedly it spent most of its life near Port Ludlow, WA supporting Pope and Talbot facilities there. Vital statistics are nominally 36" swing and 15 feet between centers. It came with a 24" Cushman Cast Iron 4 jaw chuck. It is a cone head type lathe that has nicely had a 5 HP 3 phase motor added using an automotive transmission for reduction. The final 'belt drive' where you would expect a flat belt there are 5 v-belts. For those not knowing what a "cone head" is, I would hasten to add that this refers to the old style lathes which had multiple flat belt pullies of different sizes in the head designed to be powered by an overhead line shaft. 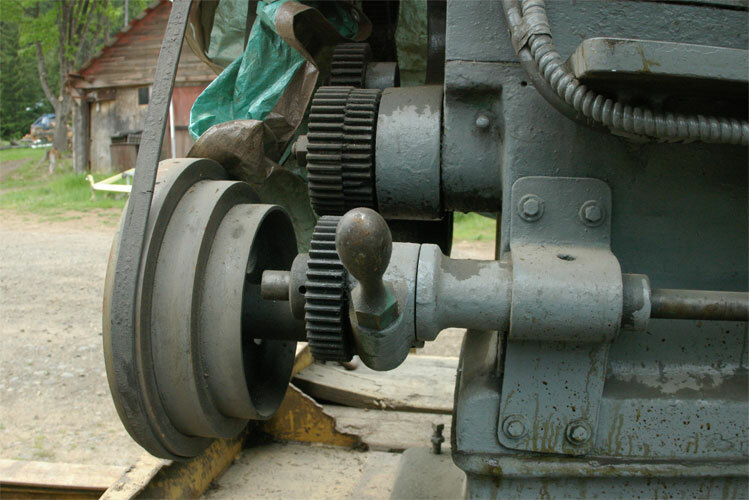 With the advent of electrification of the machine shop manufacturers began to make 'gear head' lathes which often had a clutch and an oil filled gearbox with multiple speed shifter designed to provide the wide variety of rotation speeds required for lathe use. With the addition of an oil filled gearbox the 'back gears' characteristic of the cone head went away. The back gears provided a set of extra low gears sort of like 'low range' in your 4 x 4 pickup. The line shaft would have a matching set of cones turned the other direction, allowing the belt to be moved to any 'step' without changing its length. Really big lathes of the cone head variety would have 2 or even 3 speeds in the back gears. Gear head lathes with electric motors began to appear after 1900, and by the 1920's most of the cone heads were retrofit with an electric motor and some sort of a shifter. Lima and a few others made gear box kits for the purpose but many conversions were shop made out of an automotive 4 speed transmission. The lathe has a single speed back gear. The lead screw is inside the bed, a feature of early American Tool Works Lathes. The swing has been enhanced from 30" to 36" with 3 inch blocks under the head stock tail stock and compound drive. However it could have been classed as a 34" lathe as American had a habit of providing more swing clearance than they rated, so though it measures 36" it may have been rated at less than that. The age is not determined at the moment but American tool Works was Incorporated in 1898, and they clearly were not making this type of lathe after 1927. One expert describes it as the oldest he has seen. As I get the history, First there was Lodge, and Davis & Co. Lodge left Lodge and Davis in 1892 and ultimately founded Lodge and Shipley. In turn Lodge and Davis was reorganized as Davis & Egan Machine Tool Co. in 1896, and became American Tool Works in 1898. The consensus of experts is that this is an extremely early example of an ATW product as by the early 1900's their products seems to be uniformly "quick change", instead of 'change gear', and the controls on the apron evolved. The "Quick Change" feature is not to be confused with the advent of the 'Gear Head'. 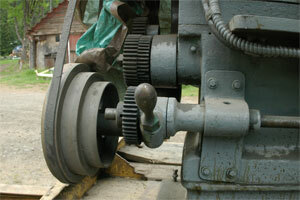 The Gear head provided a multi speed gear drive to the spindle. The 'Quick Change' was a patented idea which allowed for the rapid selection of different lead screw speeds by sliding a handle along with a gear on it which dropped into position to proved the correct leadscrew rotation speed for threading. This idea was patented in about 1902 but was quickly adopted by all lathe makers because it was vastly more convenient than sitting down with a pile of loose gears and rearranging them to get the desired threads per inch. 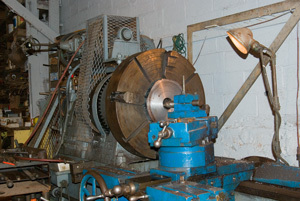 If you look at the photo of the head end of this lathe you will see the massive gear train there consisting of multiple gears, and the copy of the brass tag with a chart listing Threads per inch, and the number of teeth per gear you need to install in various locations to achieve that result. One of the downfalls of these old lathes is that the number of different threads is quite limited and moreover, they don't do metric threads. You will notice that in one of the captions I refer to the 'change gears' as 'change wheels'. The Latter is simply British terminology for what Americans call "change gears" which probably should be called "Loose change gears" as the "quick change" changes gears as well, as surely as a CD changer picks a CD to play. As a follow up, I bought Kenneth Cope's book entitled "American Lathe Builders: 1810-1910" and reviewed it for information on this machine. He reports that Lodge and Davis introduced new line of large engine lathes with an 20 thru 48" swing in 1895 and provides a photo. The twenty inch model is shown. It matches well except for a few things. My back gear engagement handle is on the chuck end, and the carriage feed and tailstock quill are hand wheels instead of ball cranks as shown in the photo. The apron is uniquely the same with one star wheel, one turn knob, and 'peeking out' handles behind the apron. I also notice the L & D product line of 1888 includes a 38" engine lathe remarkably similar to mine, but with a slightly different apron. 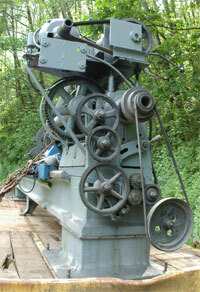 Notably their large swing lathe has hand wheels instead of ball cranks. I then look at the page for Davis & Egan machines (bearing in mind that it was a reorg of Lodge and Davis effective Sept. 1, 1896 and ending with the creation of ATW in 1898. The Davis & Egan drawings show the twenty inch model of the 1895 family of Lodge and Davis with a different name on the front. Also shown in the book is a 60" Davis & Egan, and although it is triple back geared, the back gear handle is gasp--- on the front, and it has hand wheels. the write up on ATW says that ATW continued the Davis & Egan product line which was really the Lodge and Davis product line until at least 1903 when a new model line was introuced which had quick change and a choice of gear heads or cone heads. Read together I'm inclined to believe that my ATW lathe is really the 1895 Lodge and Davis design rebadged as an ATW because it was made sometime after 1898 and before that model was discontinued. My estimate is that the hand wheels were used on the larger models because of the heavier weights to be moved (you could us both hands). While it is conceivable that ATW continued to make the change gear model post 1903, there would seem to be little reason to so for lack of better information I surmise that my model is properly dated between 1898 and 1903. the other hint is that the ATW name is only cast on the headstock casting. Later ATW designs had the ATW name on the legs or bed of the machine. 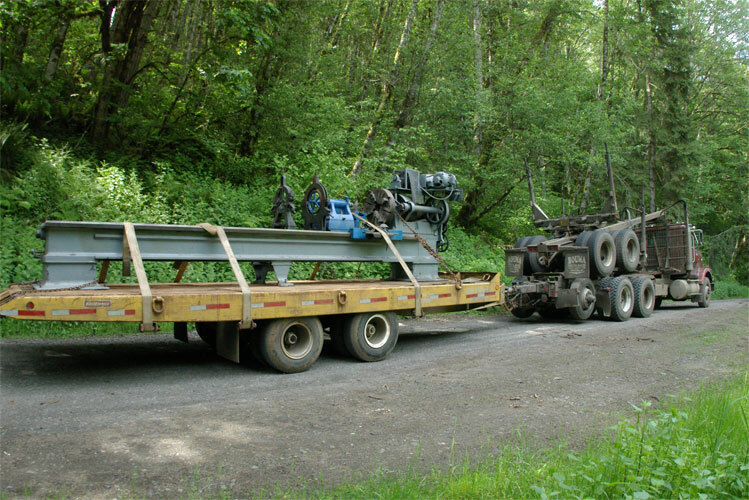 The first problem you have when you buy a big lathe is transporting it to your destination. 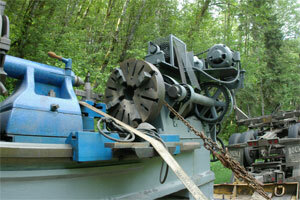 Heavy weights are not strangers to loggers, but a big lathe has its issues. They can be a bit top heavy, and just plain heavy. 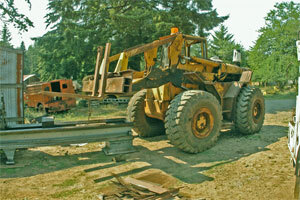 This one is around 22 feet long and weighs in the range of 5 to 7 tons. 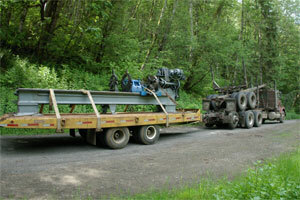 The tilt bed machinery trailer made the most sense for moving this thing. It is pretty low and was long enough and with a 20 ton rating could easily handle the weight. The sellers picked it up with 2 fork lifts and just set it on the trailer. Chuck View: The second photo down shows the back side of the lathe. 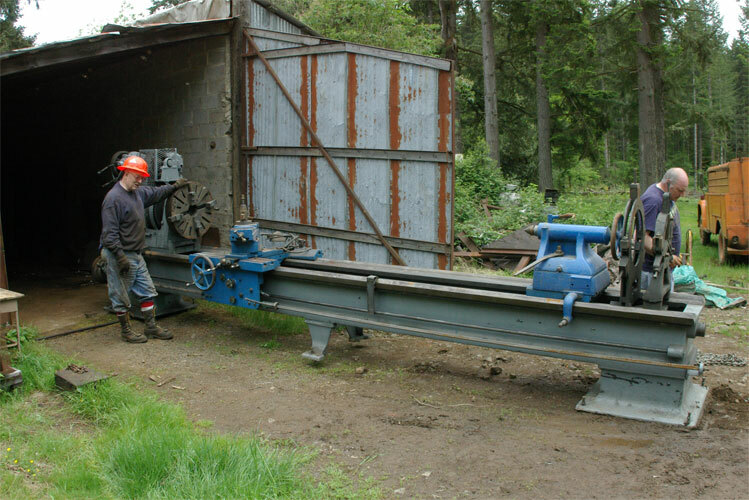 Some big lathes have two speed back gears, but this model has just one. 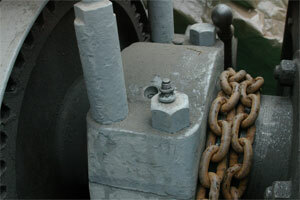 There is a traditional slip bolt between the cone drive pully. 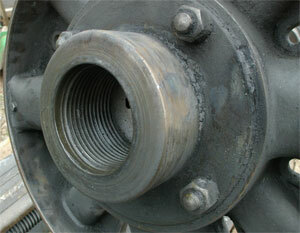 The back gear shaft is on an eccentric with the rotation handle on the front end. The Chuck is a 24" Cushman. Apron View: Controls are as follows: Top center-cross feed with split bolt lever right below it. the star wheel is turned to engage a friction for the carriage drive. The small knob on the bottom turns an eccentric to engage the power crossfeed. The handle behind the apron on the right is a 3 position one with a forward/neutral/reverse for the carriage and crossfeed (if either or both are engaged). 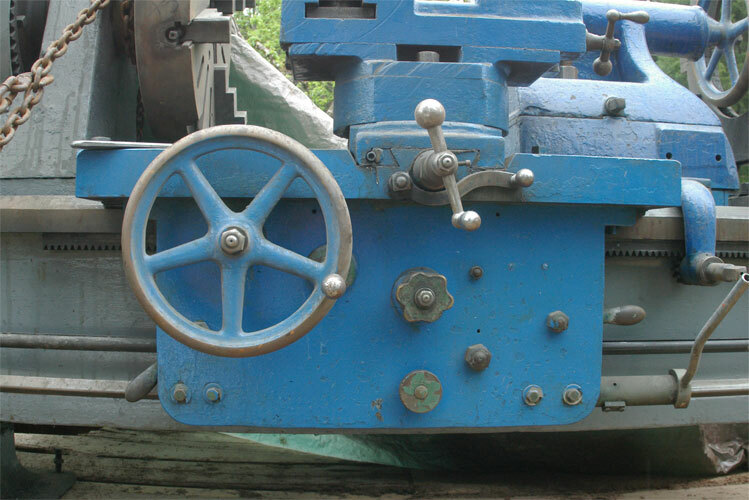 Carriage Drive: The carriage is normally belt driven but the gear train can be rotated to connect with the gear train which drives the lead screw. This would be necessary if you were cutting a scroll plate for example and needed a positive cross feed. Headstock: The headstock came with a 5 position Cone drive for a flat belt. In this lathe the second cone down has had a sleeve slipped over it with 5 Vee-Belt groves in it which go to the countershaft above. The spindle turnes on bushing bearings with multiple oil holes. Inside the bed lead screws were unique to Early American Tool lathes. The reason is not clear. The pipe handle on the lower rod is just a control for the electric off on switch. 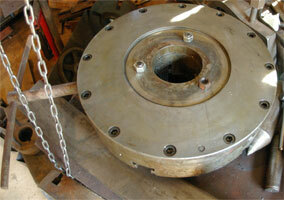 The spindle is 4.25" in diameter and is 4 threads per inch. Newer American Lathes had a proprietary tapered thread. The Chuck back. 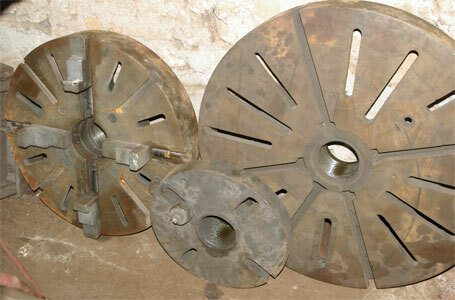 It is a Cushman Cash iron 4 jaw. The lathe also came with a face plate. 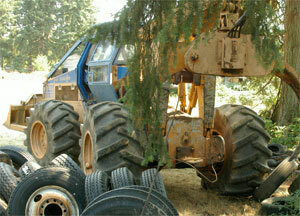 We used a log loader to set 'er off the tilt bed trailer. 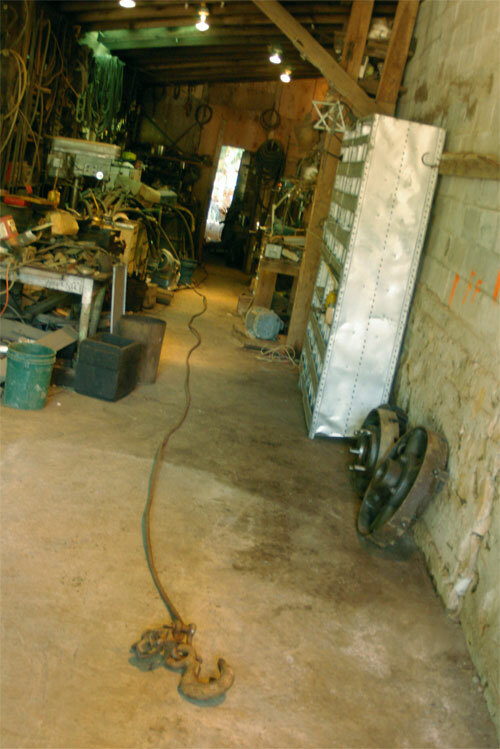 We need to do some work on the floor before sliding it inside the shop bay. It is important to have a solid floor so the lathe can be properly leveled. Once we got the floor fixed, that came the task of sliding the lathe inside. 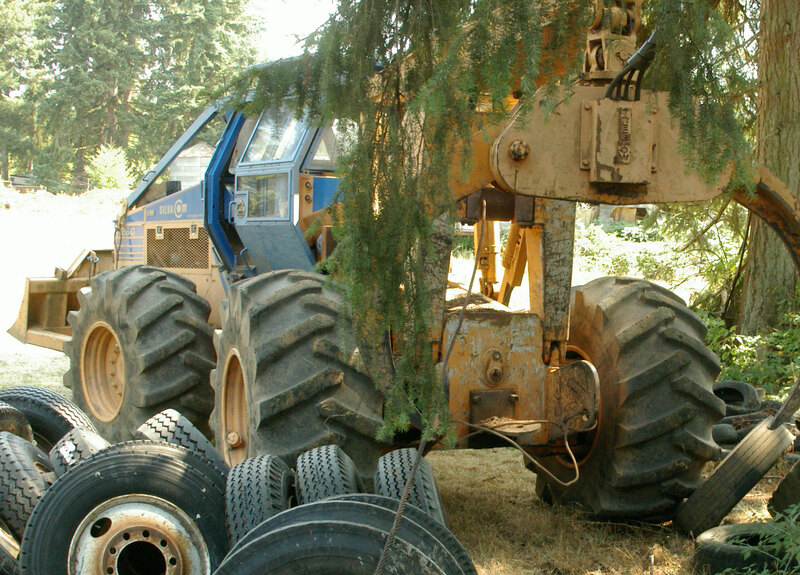 A log skidder out the back door of the shop with a long line helped. We jacked up the front and and set it on a skid plate and attached the line to that. We lifted the back end with the fork lift and just winched and walked 'er right into the bay. There she will be leveled up in due course. For a Photo essay of 'Making the hub' Follow this link. One of the issues that you have to face when getting a new lathe is that you may want to add a chuck to your collection of things. "New" of course is relative as this lathe is only new to me. The 4 jaw Cushman chuck is an old enough model that it may have come with the lathe new. Cushman has been around for a long time. Anyway as I mentioned the 24" cast iron chuck is not in the best of condition so I have been chuck shopping. While ultimately, the replacement chuck will be on the American, at this writing I don't quite have it in service. Thus I have begun making the chuck mount on the London Machine Tool Lathe. Everything to do with a large lathe is heavy and this work is no exception. The first photo on the right shows the back side of a fairly massive 3 jaw 18" Cushman. I bought the chuck used and have not been able to determine exactly what model it is. It doesn't bear current model numbers so I presume it has been around for a while. 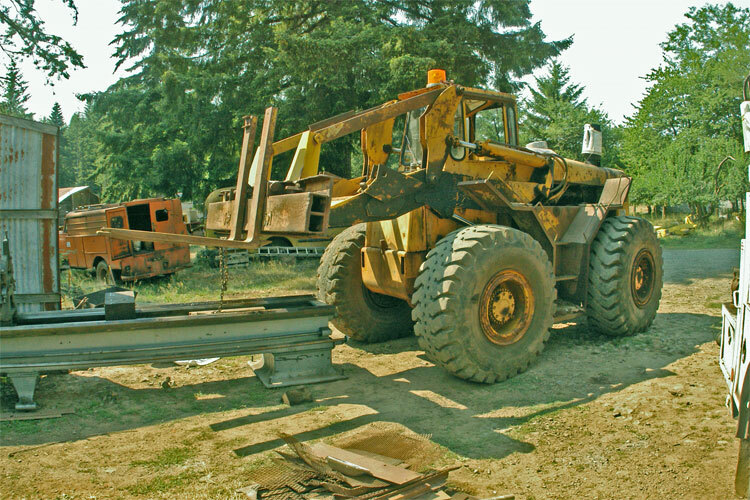 It is steel bodied and at least uses the jaws of current Cushman Chucks of that size. I rather suspect it is a medium duty and not a 'heavy duty' model as currently aligned by Cushman Industries, but I can't be sure. Cushman does not currently list an 18" model in their lineup of medium duty chucks. I took the thing apart to check its condition after I got it home and these things are quite amazing. Their simplicity is astounding. If you take the bolts out of the back the body splits in half. The main operative part is a scroll plate. 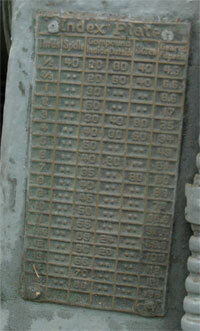 The jaws are all engaged on the scroll plate and move in and out as the plate is rotated. There is a grease fitting in the face for greasing it. On the back side of the scroll plate are a set of gear teeth which engage with the piece that you put the chuck wrench in to adjust the chuck, and that's it---all the pieces there are. The jaws are 2 piece affairs. Smaller chucks often come with 2 sets of jaws--- an 'in' and an 'out' set. This size chuck comes with bolt on 'top jaws' which can be reversed if you want the steps on the other side. 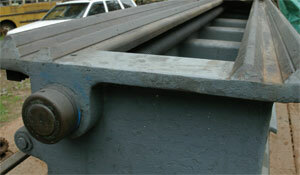 Additionally the chuck top jaws have 2 positions about 1.5" apart. This gives you an additional 1.5" of adjustment, allowing the chuck to close down for fairly small items but open to accept things to it s full diameter of 18". The minimum recommended size of things that you should grip with this chuck is posted 2.53". This is actually smaller than the 3" minimum recommended for the 15" chuck. The 21" chuck will close even tighter to 2.28". 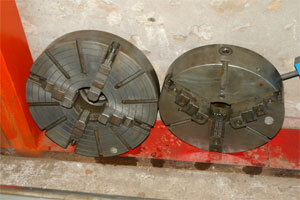 The reason for this is that the jaws have multiple positions (2 for the 18" chuck) and 3 for all larger chucks. Physically the chuck will close tighter than that, but much of the jaw gets off the scroll plate which isn't a good thing. The largest in this series, the 36" model has as many as 6 places to set the top jaws, and will close to 2 inches and open to 36". The 24" chuck seems to be the worst in its class having only a minimum closing of 5.28" making it not particularly usable for smaller work. In the old days chucks were commonly threaded on the spindle, and while there were some 'common' thread patterns, there was little standardization. By the 1930's, efforts were made in the US to standardize the chuck mounting methods. Of course no one could agree on a 'standard' so there are 3 major standards, and each 'standard' has multiple sizes within that standard. These 'standards' include the "A" mount, the "D1" mount, and the L-long nose mount. 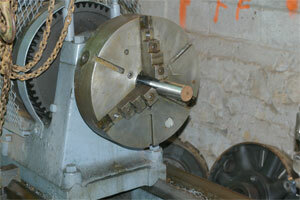 In order to mount a chuck on a lathe you need to accomplish a couple of things. First you have to properly align it, and then you need to hold it there. With the thread mount the aligning is done by screwing the chuck on the threaded spindle, and then the back of the hub comes up tight against a shoulder behind the threads so the chuck will still be aligned even if the threads are loose. The "A" mount and the "D1" mount share in common a short taper (it varies on the size--but less than half an inch) on the front of the spindle. What is different is how the chuck is held on. The "A"s and their relatives are held in position with a bolt circle running in through the front of the chuck and into the end of the headstock spindle. 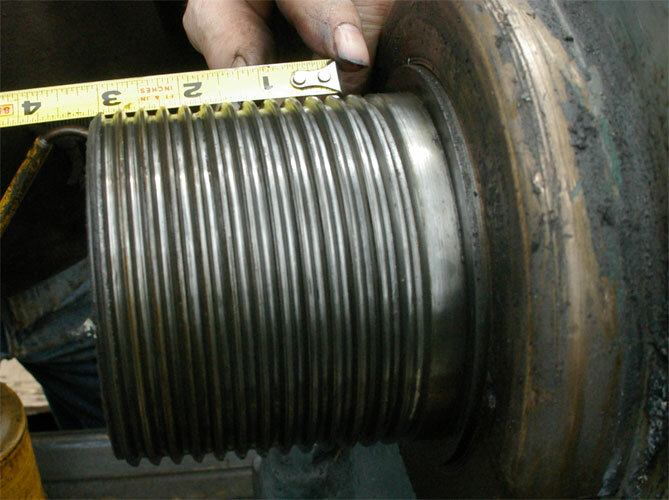 The diameter of the bolt circle (and the diameter of the taper-bore vary. Thus you have A-6, A-11, A-15, etc. where the number following the letter is the nominal diameter of the outside of the mount. The D1 has the same taper bores but the holding is different. What are bolt holes all the way through on the A series are just threaded bolt holes on the back of the D1 style chuck, and a lug screws in the hole with a notch out of it. The headstock is equipped with cams that turn into the notches locking the chuck into the headstock. This the D1 style is called a 'cam-lock' mount. This is the most popular style at the present time. The L mount is much different. The L spindle is tapered for several inches and a large diameter draw nut lodged behind a collar on the spindle screws on the back of the chuck holding it up on the taper. The taper is keyed preventing the chuck from slipping. In the larger sizes, any of these chucks can be adapted to a screw mount lathe. Of the variants, the "A" mount is probably the easiest. Since it bolts through the front, you can simply make a threaded piece to screw on your threaded spindle and bolt the chuck to it with the bolts through the front of the chuck. This is not unlike the 'flat back chucks' with one exception. The critical mating surface for a flat back chuck is the bore hole on the outside of the adapter---that is to say your entire adapter slips into a recess in the back of the chuck thus holding the chuck true. With the "A" style you have to turn off the adapter to leave a protruding taper in the middle that will seat up with the taper inside the chuck. Then you Bolt it up. Large diameter 'D1 mounts" can be done the same way except you put the holding bolts in from the back. D1-6 and smaller are a diaster, because the bolts into the chuck have to go in from the back, but they conflict with the threaded spindle so you can't put them in from the back. I've got one to do,but the job won't be elegant. Stay tuned. I've also done an L series adaptation. The smaller 'L's could be a problem because the draw nut needs to slide over the spindle adapter from the headstock end. Conceptually you get a large chuck of shafting, thread it internally on one end to screw on the spindle and turn a taper on the other end--and key it to hold the chuck and you must leave an oversize in the middle for a collar to hold the drawnut. The down side of this adaptation is that the adapter is fairly long, extending the chuck quite a ways out from the headstock. This could create more runout issues. The chuck you see here is what is known as a 'Flatback' chuck. It isn't made to fit anything. I presumes than an adapter will be attached to it. The adapter could not be an 'A' mount because those have to have bolts through from the front, but any threaded spindle, an L mount or a D1 mount could be attached to this chuck. Here I have made an adapter for my thread mount. I made it on another lathe because I had one, but I do the final prep work on this lathe. 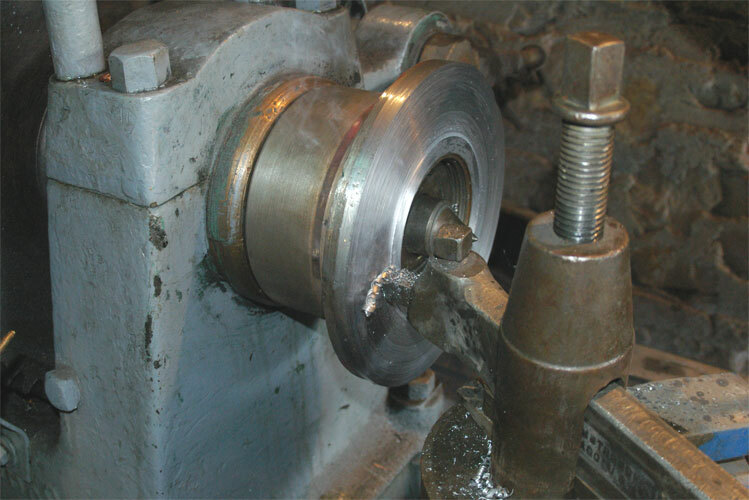 The spindle adapter is mounted on the ATW lathe and faced off to run true as it mounts, and the overall diameter is adjusted to the exact size of the bore hole in the back of the Cushman lathe (9.509"). A transfer punch is used to make the 3 ea 5/8ths bolt holes that will hold the chuck on and those holes are drilled and tapped for the 3 allen head bolts that attach the chuck to the mount. I used a good drilling and milling machine to assure the holes are drilled straight, and then the tapping was done by hand on the lathe as that was a convenient way to hold the mount. The tapping was started with traditional tapered taps and then a 'bottom tap' was used which is non-tapered so threads could be cut clear to the bottom of the holes. To test the accuracy of my work, I dressed up a piece of aluminum by holding it on a center and turning it true to the center. Then I turned it end for end and chucked it up on the dressed up end and ran a dial indicator for runout. I was within .002" runout which I feel is a reasonable tolerance for this sort of equipment. 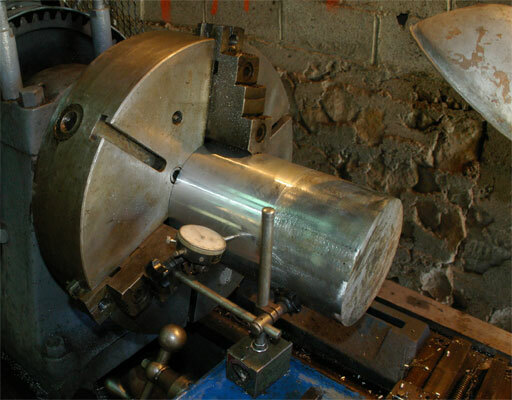 Only multiple observations over time will confirm the accuracy of the lathe. Well, I have run the ATW for a while and am getting some impressions compared to the similar sized London Machine Tool Lathe. The two machines are contemporaries, both manufactured without question in the first decade of the 20th century---likely early in the decade. It is sort of sobering to go back and look at what other machinery of the era looked like. For example the Automobile barely existed, yet these lathes are very much a usable piece of machinery. Every old lathe has a personality, and its own quirks that you have to deal with in order to get anything done. Both lathes have them. First out, I thought the belt driven feed rod would be a negative issue. Frankly it isn't. It uses an inch wide leather belt and has a 3 step cone. I've had it in the slow position and have been very happy with it. It has worked flawlessly. There is feed reversal on the apron so the nature of the feed mechanism on the headstock is out of sight and out of mind. By contrast the LMT has a combination feed rod/lead screw so when you change the gears for threading you screw up the feed speed---though there is a 3 speed shifter to partially compensate for that. The LMT has the screw reversal up on the head end of the lathe which is inconvenient to reach, and while it might seem an advantage because it changes the threading screw as well---you can't shift it without losing your thread sync so that is no advantage. The back gears function traditionally--- a slip bolt releases the cone from the spindle and the back gear shaft is on an eccentric. 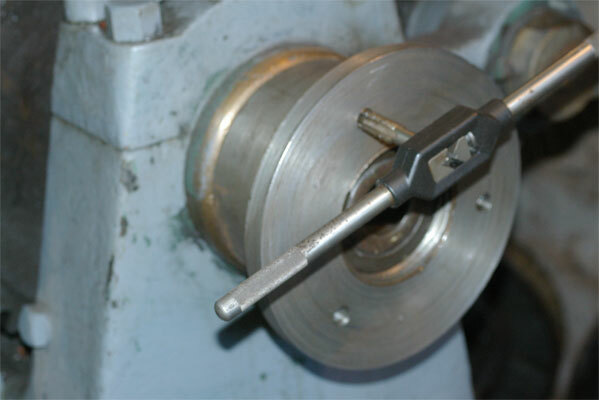 The lever for engaging the shaft is on the Chuck end of the lathe on the ATW instead of the more traditional head end. While difficult it is reachable and this saves you 10 feet of walking every time you want to engage the back gears. The locking mechanism (the slip bolt slot) on the ATW is damaged some making the job difficult to hook up---part of the lathes personality. Also the ATW lacks the 2 speed option of the back gears which was present in the LMT to support the large swing in the gap. 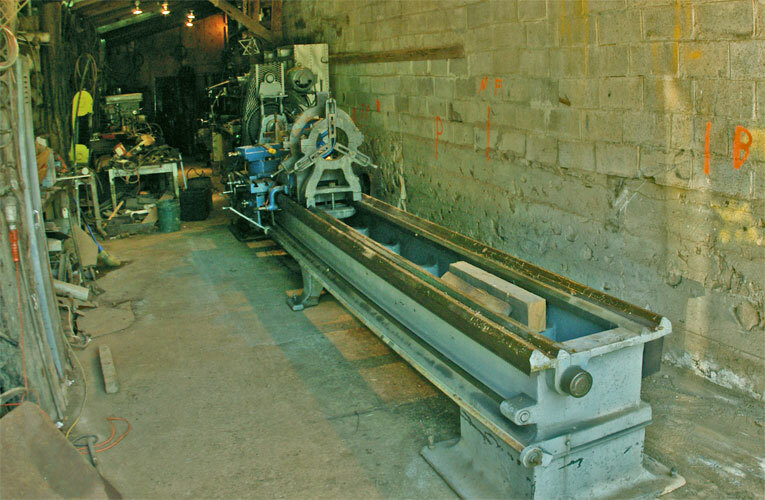 The ATW is a 'blocked up lathe'.--- probably a 30" lathe blocked 3" to 36", but actually clearing about 38" over the ways. The dark side of blocked lathes is that they usually don't have extra cross feed travel to support the swing enhanced by the blocking. The LMT has an extended cross feed that protrudes a foot or more in front of the carriage. Part of the personality of the LMT is that the gibs are well worn, and if they are reasonably tight in the normal working area--- you can't move the cross feed back on the 'extended' cross feed area anyway---but it does make a good table and provides a good place to set a dial indicator. 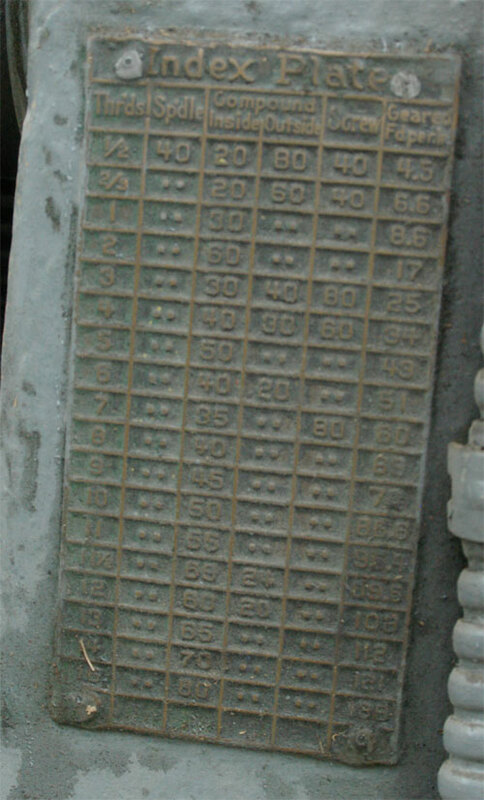 Finding a place to set a dial indicator on the ATW cross feed is difficult. The cross feed on the ATW is smooth throughout its length of travel. Either the cross feed has been rescraped---or never worn out in the first place. The ATW came with a taper attachment that I haven't used. You can easily completely remove the cross feed screw, so you don't need to worry about wrecking it with a taper attachment---the way you disconnect it is to simply remove it which is easily done. The thrust bearing is right behind the crank and it along with the whole screw, just unscrew from the cross slide. 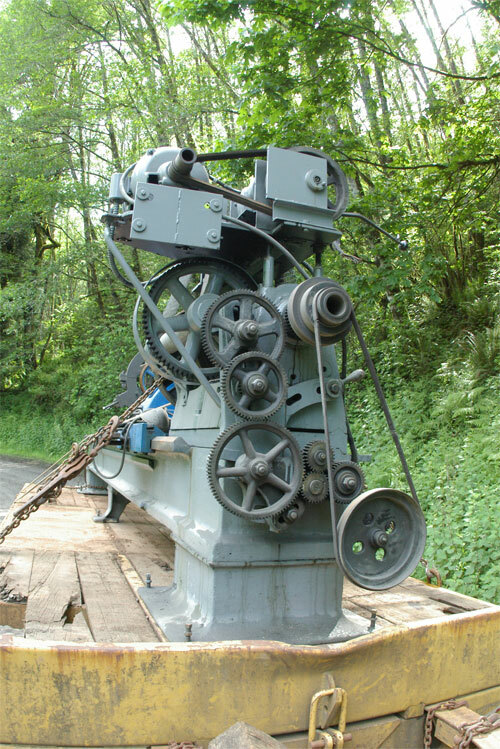 The ATW change gears and their assembly are massive and heavy. I've fiddled with them but haven't changed them yet. I think it just about takes to guys to assemble and engage them. Except when threading you leave all the gear train disengaged. The Feed rod belt runs from the spindle to the feed rod, so you drop the screw cutting gears loose at the spindle so there are no gears turning in this machine except in the apron (and the back gears if engaged). The gears are much heavier than those of the London which must run all the time---as they run the feed. The power cross feed is a twist knob clear on the bottom of the apron. As low as the bed is it is very hard to reach. 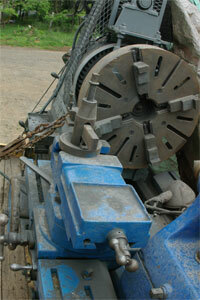 Give a bonus here for the LMT that has a slip shaft that engages a gear right on the cross feed crank. 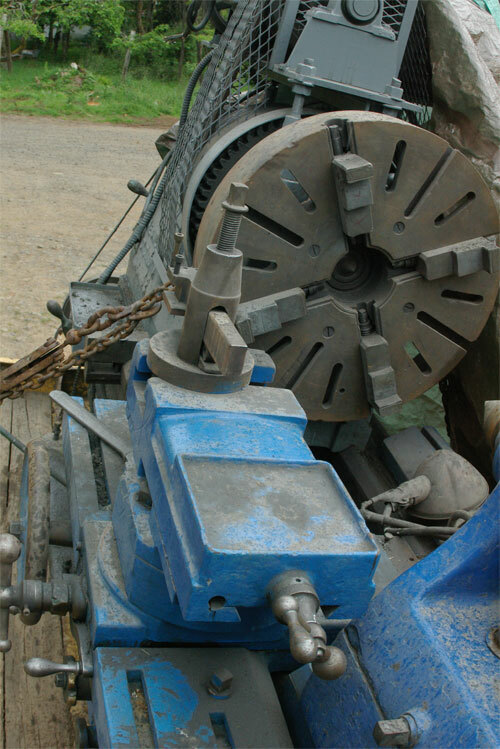 The feed clutch on the ATW is a classic star wheel that you turn compared to a twist handle in the middle of the carriage feed hand wheel on the LMT. Equal here except the LMT is all buggered up in in the apron and the carriage feed doesn't work well because of damage. Also the ATW carriage hand cranks much more easily to to a better gear reduction---but you do a lot of cranking. 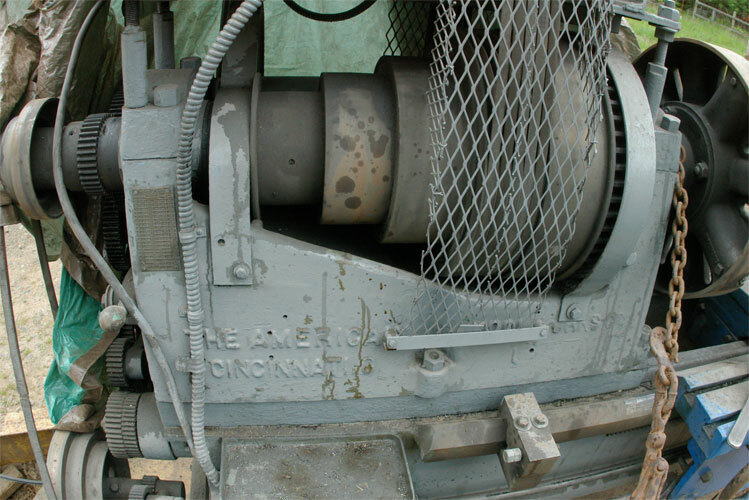 The interlock between the half nuts and the carriage feed preventing both from engaging is a traditional feature, and a good one, but is lacking on the LMT. As for speed it seems that the LMT turns faster because it clanks and rattles a lot up in the aftermarket speed reduction assembly while the ATW is dead silent, but a tachometer says that I am running the ATW and speeds faster than I have ever used the London even though the ATW has a Maximum speed of 200 RPM. It will actually run smoothly and quietly at that speed (and burn up cutters if you are working on anything of any size at that speed). 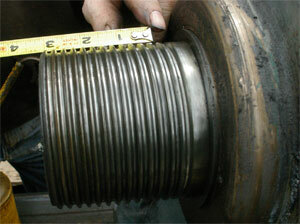 One of the issues that I have had to address is the drive belt for the feed rod. The lathe came witih a 1" leather belt that might have been the original. It was certainly rotten enough to be. It had a couple of splices in it and you wondered why it held together at all. The answer, of course, is that it didn't for long. Then I had to think of what I was going to do for a belt. While there are probably places that still make leather flat belts, I was in the middle of a project when the belt died and so immediate repairs were called for. Well I didn't hae to look far for a solution. Automobiles are back to using flat serpentine belts, and I found one the within the length of my slack adjuster and turned the belt inside out and put it on. The belt is happy and I expect it will run for years. After all it turns very slowly and moves very little power. I was a bit appalled when I first saw this lathe and the flat belt drive for the feed rod thinking that this was an inferior solution. It was abandoned with the advent of 'quick change' just after the turn of the century because quick change lathes had gear train turning all the time on the head stock anyway, but it really does work well, and with the 3 step cone pullies you can change the feed speed by resetting the location of the belt. The bottom pully swings on an offset for a tightner and has a simple clamp to hold it in position. 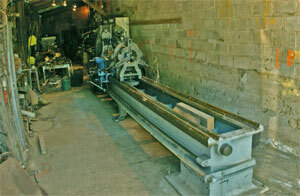 A lathe is no better than the assortment of tooling that you can assemble to go with it. This includes work holding equipment such as chucks and face plates, and steady rests, and also tool holding equipment such as boring bars and the like. The lathe came with a tired 24 inch 4 jaw chuck which possibly could be as old as the lathe itself. The chuck had plenty of problems, though it is usable for outside holding. My first order of business was to round up some more chucks for it, and scattered around on this page and related pages are several chucks that I collected. Up a ways on the left is a conventional Face plate, and a dog plate as well as the 24" Cushman that came with the lathe. Below it is a 20" cast Iron 4 jaw that I rounded up and an 18" 3 jaw Cushman scroll chuck which I am pretty proud of. A local auction produced a couple 12" chucks that I was able to adapt as well. There are also several other pages in the shop section of this site that feature chucks, and steady rests and other tooling for this lathe.